If you were a fan of Three’s Company and Alice in the 1980s, you’ll enjoy Billy Jean, Armadillo Queen. Marla arrives on the scene after a few personal setbacks. Accepting a job as a waitress in a character theme restaurant, she is transformed into Billy Jean, Armadillo Queen. The staff ridicule, interactions and backbiting are reminiscent of so many situations where personality conflicts make spending time at work uncomfortable. Donning her Billy Jean alter ego gives Marla a chance to ‘act out’ in ways that she’d never dare as her real self – with quick redneck banter laced with southern charm. Marla begins to realize levels of freedom that are startling and uplifting. Marla’s journey is toward self-acceptance. She learns not give negative thoughts power and influence over her actions and decisions. Based on experiences in her own life, Megan Scott wrote Billy Jean, Armadillo Queen in two formats; as a stage play and as a narrative. In both formats, the warring forces between Marla’s Light and Dark self-talk are entertaining and raunchily humorous. The dialogue clearly demonstrates the energy and force that thoughts have over daily life and overall level of happiness. Using laughter to teach such an important lesson is a lovely way to shine a light on a healthier way of thinking. Are you an expert in your field? 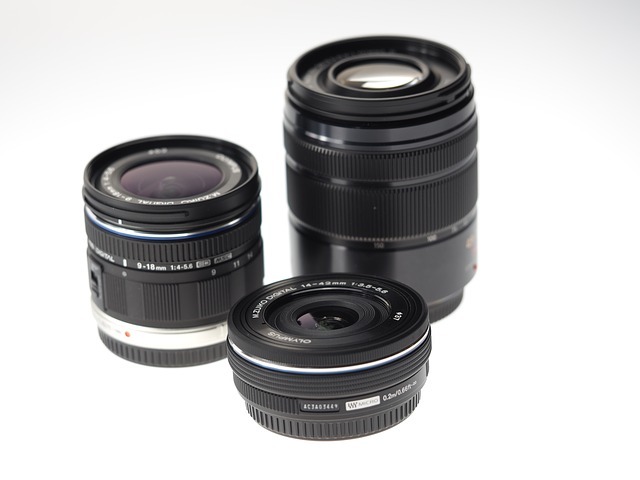 Do you want to increase the quantity and / or quality of your customer base? Would you like to expand your service offerings into paid speaking engagements? If you answered, ‘yes’ to any of these questions, writing and producing a book (e-book or print) may be worth some serious consideration. Below is an excellent video series that outlines how to organize, compose and write your business boosting book. Publishing a book is not an endeavor to enter into casually. With the ‘relative ease’ of self-publishing, there are more than a few ways to go terribly wrong and end up sabotaging your business growth efforts. The webinar below explains the complexities of interior page layout and design. 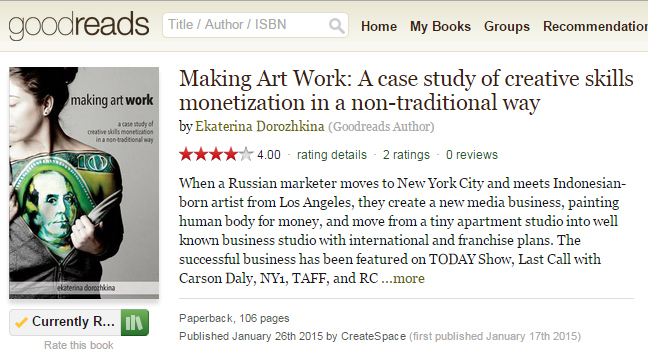 It discusses what makes a book look like it has been professionally designed vs. a DIY project. Like any product that one would take to market, a book has production costs at the front end and distribution and marketing expenses once it’s complete. A savvy business person will know when it’s appropriate to do the work yourself and when its time to hire an expert. The following is a list of the most common (and wise!) areas to plan for investment in your book project. Below are a few resources for editors and cover designers. *Line Editing is the nuts and bolts of sentence and paragraph structure and punctuation. If you have a product to sell – if you are a performer or an artist – or if you just want to find more clients then a custom e-mail signature can help grow your business. An e-mail signature is a stylish, effective and non-intrusive way to announce to the world (or at least the people you communicate with via e-mail) an abbreviated bit of your business story. If you enjoy the do-it-yourself approach to marketing and technical ‘computery’ stuff doesn’t send you screaming for the hills, this article will show you the steps necessary to add flair to your online communications. 1. Seeing the code. Once you learn what goes where, you can do a search for other types of HTML code that will do even fancier things. The graphic above shows a sample custom e-mail signature along with the code that is used to generate it. The first line of the signature “Samantha B. Jones” in the purple box, corresponds with the first line of HTML code. In the HTML purple box, notice that <b> means ‘bold,’ <font size=”4″> is the size of the font, and <face=”Times New Roman,” is the font type. 2. Basic Design. Simple is always a good rule of thumb. Think about the most effective e-mail signatures that you have received. Which ones invited you to click further to learn more and which ones turned you off? 3. Write the Code. Here is the code for the design above. Copy it and begin to play around with it. *The items that I highlighted in green are areas where you can customize it and where you need to provide links to online images or your websites. 4. Test the Code. Copy and paste your code into an HTML viewer to see if it works. Another option is to insert the code into your e-mail program, then send yourself multiple e-mails until you have it just right. 5. 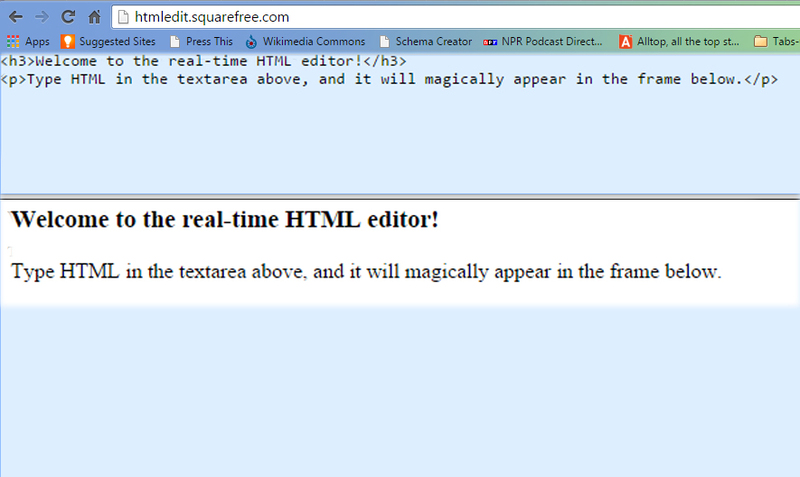 Insert the HTML code into your e-mail program. 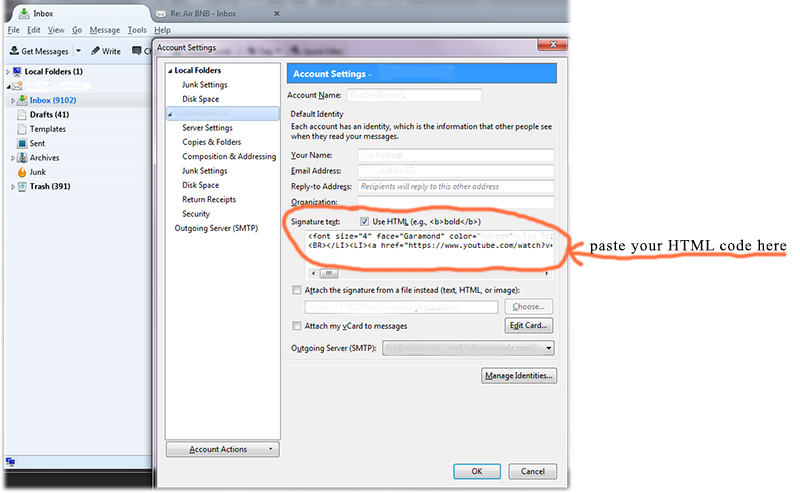 The screen capture image shows Thunderbird e-mail, but the names and steps for other e-mail programs should be ‘roughly’ similar. In Thunderbird, go to “Tools” > “Account Settings,” then insert your code in the ‘Signature text’ box. Once you click on ‘Save,’ you can write a new e-mail and send it to yourself to test any links or images that you’ve included. There you have it – the basic steps to begin creating an enticing e-mail signature. It can start as a cry at a higher than normal pitch, a raging fever that won’t come down, bruises that appear for no reason. A parent, consumed with worry seeks out help. The Pediatrician makes a preliminary evaluation and orders more tests. Then the moment arrives…words, delivered with professionalism and care from the doctor; everything has changed for the family and the child with the difficult diagnosis. For nearly 300 families in Nevada County (California), these experiences are part of their story. But that’s only the beginning. A new reality sets in—one that involves long drives to special care units at UC Davis, San Francisco or Stanford and physician specialists, dieticians, nutritionists, social workers and rounds of medication. Maryellen Beauchamp has a special connection with these families. 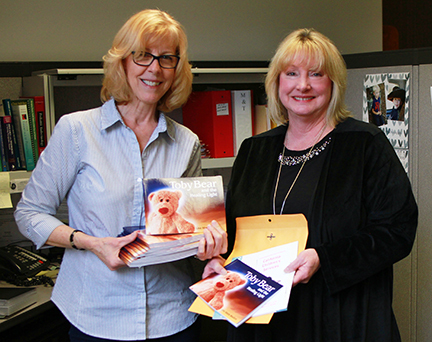 She is Nevada County’s Public Health Nurse Case Manager for California Children’s Services. 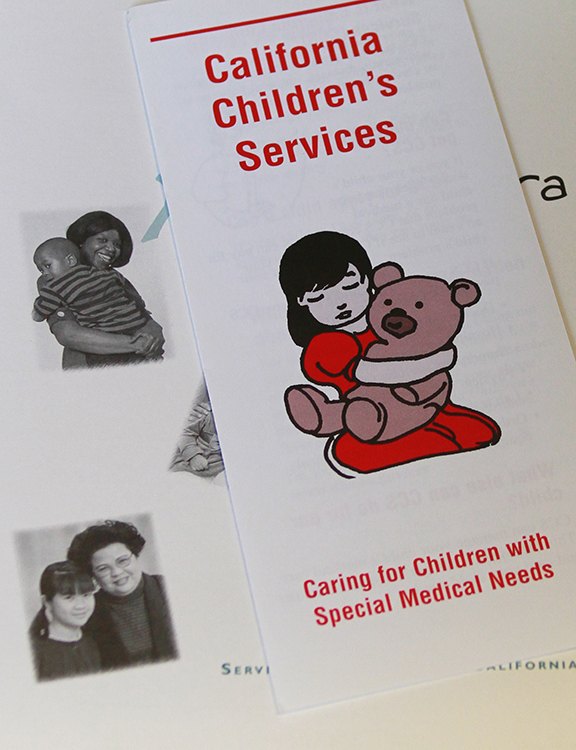 California Children’s Services is operated by the State of California. Over 80 years old, it has an office in every county. Maryellen acts as the conductor in an orchestra that encompasses multi-faceted medical assistance for children with severe health issues. These issues can range from growth plate or skull fractures, endocrine, neurological, orthopedic, and metabolic disorders to Cerebral Palsy, Muscular Dystrophy and premature infants. Maryellen recently had the opportunity to incorporate something important into her program—a sense of positive empowerment for her young clients. It came in the form of a beautifully illustrated book, Toby Bear and the Healing Light. It is the story of a stuffed bear who teaches a sick child the power of affirmations, meditation and visualizations in the healing process. 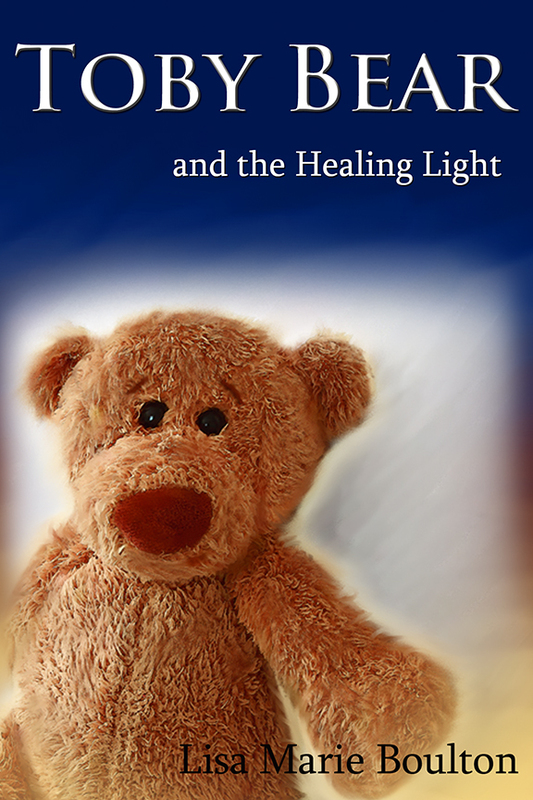 Toby Bear and the Healing Light was created by author, Lisa Boulton while undergoing cancer treatments, as a gentle way to help children going through difficult illness. Boulton enlisted photographer and artist Lisa Redfern to create the photo-illustrations. “I wanted the story to feature local people, places and businesses as a way to express my love for our community and for the outpouring of support and caring that I received when I was sick,” says Boulton. Read more about this topic at The Union.com. Have you discovered Goodreads Giveaways? 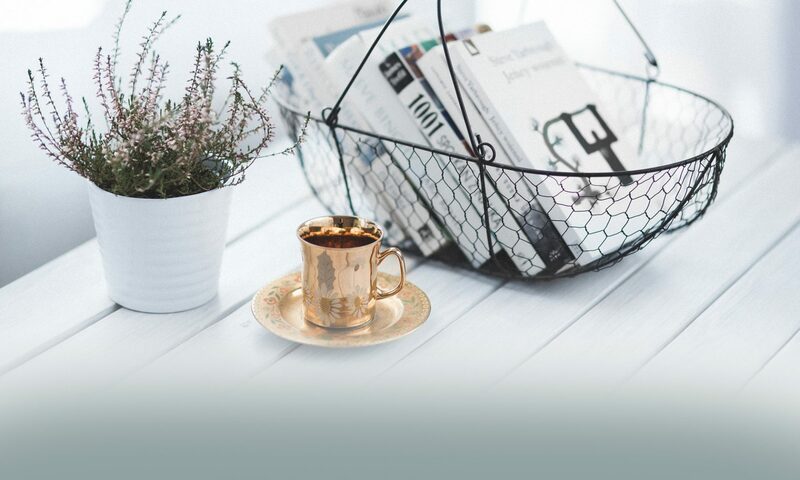 It’s a great way to find new books and authors…and it comes with the thrill of winning a prize. It’s also a way for new authors to get their work in front of an audience. Every day hundreds of publishers and independent authors mail out FREE copies of their (print) books to Giveaway winners. 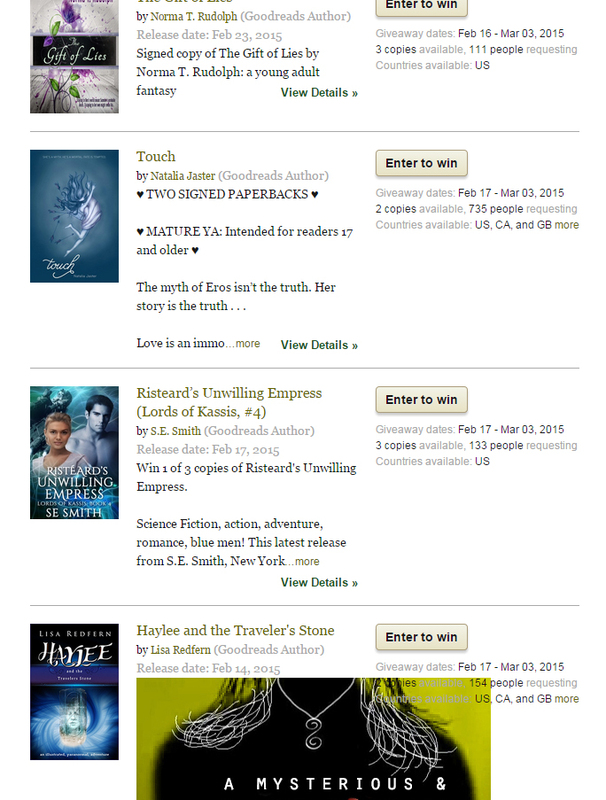 To enter the contests, the only requirement is to be Goodreads Member. To set-up an account, all that you need is your name, e-mail and a password. You can search Giveaway books according to your favorite genre, by popular authors, or just by browsing through the “ending soon” section. According to CreateSpace, Amazon’s printing affiliate, there are 1,500 new titles published daily. If you are a writer, you know that those numbers mean a sizable marketing challenge. For authors and publishers, a Goodreads Giveaway is one way to connect with their 20+ million members. It exposes a new title to a target market in a selected state, or worldwide and it gets the ball rolling for reviews…and best-of-all, it doesn’t cost a thing. In order to run a Giveaway, one must become a Goodreads Author. 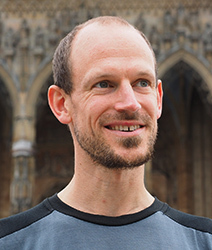 Once you’ve signed up for a general membership, you can then set-up an Author Profile. I am looking forward to learning some new art marketing tips and I can’t wait to see samples of her body painting (a Pinterest interest). My first Goodreads Giveaway campaign is off and running – now through March 3rd. Within the first 24 hours, 171 people have entered the contest. Roughly half of them are in my target market (14-25 year olds). That’s 171 people who had no idea that Haylee existed yesterday. Already, I’d say that the campaign has been a success. 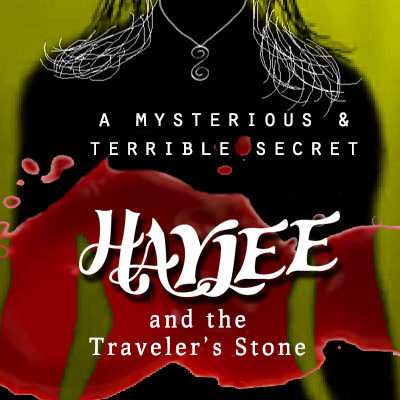 If you’d like to enter to win a copy of Haylee and the Traveler’s Stone, click here. I hope whoever wins the Haylee Giveaway is as excited as I am to win Ekaterina’s book. Connect with me on Goodreads. If you are a Haylee fan, you’ll discover a bit of the back story in this condensed author interview. You’ll also learn about the historical research – San Francisco and California Gold Rush – that went into the project. Created to coincide with the release of Haylee and the Traveler’s Stone (paperback), the interview contains marketing and social media tips for authors. It also delves into character development, creativity and sources for Public Domain images. The original, in-depth author interview can be read on the blog, You Read It Here First. You Read It Here First Blog owner—Christina Hamlett, Screenplay Consultant, Media Relations Expert and Award-Winning Author.